Chandler Palethorpe, the designer of Park Liner, has been camping for a long time. He started with tent camping all over the country, but eventually he wanted to bring his family along. He couldn’t do that in a tent, so he bought a small fiberglass trailer from another company and started taking his family on trips. The camper did its job well, but to Chandler it wasn’t the best – with all the wasted space, peeling trim, and leaks around the camper. After contemplating those problems, Chandler had the idea of a better camper, a camper that he could design from the ground up, his own way. Over the next couple years, and still camping in that other trailer, Chandler was thinking about all of the things that he could improve and add to his camper. Finally, in 2007, Chandler designed the ParkLiner exactly as he wanted it, from the ground up, to fit everything that he thought was possible in such a small place. He invested a lot of time and energy in to the ParkLiner, and his efforts paid off. Park Liner Inc. says, “The result speaks for itself. The graceful lines, efficiency, and strength of the Parkliner have more in common with a fine sailboat than with most camping trailers. Indeed, the ParkLiner is the sleek sailboat of the ultra-light camper class. It’s quite simply the best ultra-light camper you can get for the size. Extraordinary interior features that only Chandler could imagine and figure out how to fit gracefully into this small space. Two comfortable seating areas; a couple doesn’t have to fold away the queen bed in order to sit down to coffee and breakfast. Far more cabinet space that the competition. A ‘vanishing bunk bed’ so that the ParkLiner can sleep up to four―and that’s before you put the little one in a sleeping bag on the floor.” The Parkliner is so popular the company has had no need to build or manufacture other models. 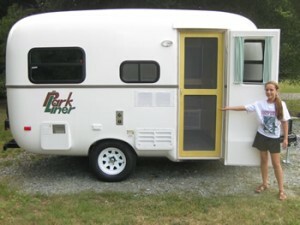 Park Liner manufactures camping trailers that measure just 15 feet from the tongue to the back bumper. 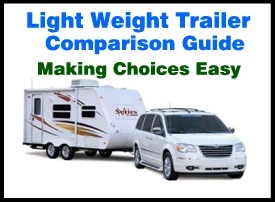 The company is based out Gibsonville, N.C.
To see how Park Liner compares to other light weight trailer manufacturers in the industry order our Travel Trailer Comparison guide today. It is full of information to help you find a quality manufacturer who is reputable in the industry. There are helpful negotiating tips and a full chapter on construction methods used today.